In project management, a task is an activity that needs to be accomplished within a defined period of time or by a deadline to work towards work-related goals. A task can be broken down into assignments which should also have a defined start and end date or a deadline for completion. Tasks are the basic unit of action in Gantt Excel. You can create tasks, assign them to yourself or others, set costs and dates for tracking and add notes for context. This is the fastest way to create a new task. As soon as you hit enter a new task is created and WBS automatically updates. You can also double–click the text “Type here to add a new task” to open the task details form. The third method is to use the Add Task buttons on the Gantt tab. You can also add a task in between tasks by selecting ‘Add Task at Selection’ or ‘Add Task below Selection’ from the Gantt Tab. Add Task at Selection will insert a task at the current selection and the new task will inherit the WBS number at the location it is added. The existing task will be pushed down and it will inherit the next WBS number. Add Task below Selection will insert a new task below the task that is currently selected and the new task will inherit the next WBS number. Tip: Shortcut key to add a task is Alt G-A and then you can use the arrow keys to select the options. There are multiple ways to edit a task. You can edit the task fields in the excel grid itself. This option is the easiest. Or click on any row that contains a task and click the Edit Task button. This will open up the task detail form. % Completed – Actual percentage completed for the task should be entered here. Baseline Dates: Baseline dates are essentially a snapshot of the estimated dates when a task is created. While the estimated dates may change often, the baseline dates should not be ideally changed. It gives the stakeholders a fair idea as to when the task was originally supposed to start or end. These dates are useful for management. Add the Baseline Start field to a task sheet when you want to compare baseline start dates to scheduled or actual start dates for tasks. Actual Dates: Actual dates are the actual dates when the task was started and completed. They should be regularly updated to reflect task current status. Actual Duration – (calculated automatically) – The actual numbers of days taken to complete the task. 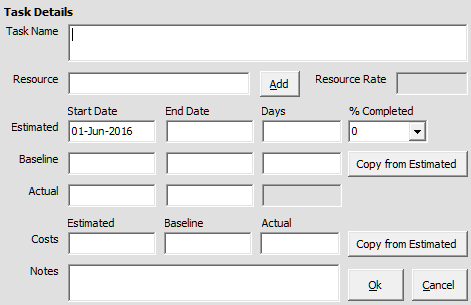 Baseline Cost – When the ‘Copy from Estimated’ button is clicked the Estimated cost is saved into the Baseline. to how much the task was originally supposed to cost. Notes – Task notes or comments can be added to the text area. Helpful to capture additional task info.